Dan Helfman 9968a15ef8 Clarifying code style for multiline constructs. 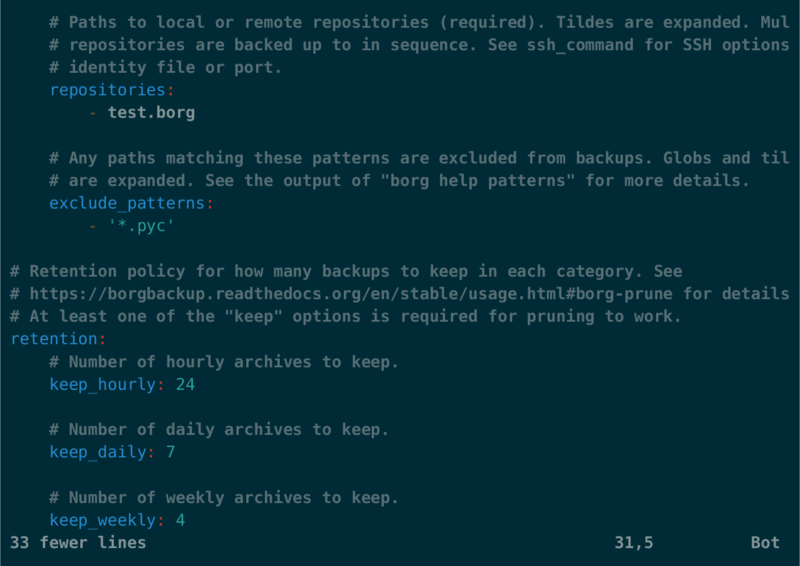 borgmatic (formerly atticmatic) is a simple Python wrapper script for the Borg backup software that initiates a backup, prunes any old backups according to a retention policy, and validates backups for consistency. The script supports specifying your settings in a declarative configuration file rather than having to put them all on the command-line, and handles common errors. # List of source directories to backup. Globs are expanded. # Paths to local or remote repositories. # Any paths matching these patterns are excluded from backups. # Retention policy for how many backups to keep in each category. # List of consistency checks to run: "repository", "archives", or both. borgmatic is hosted at https://torsion.org/borgmatic with source code available. It’s also mirrored on GitHub for convenience. To get up and running, follow the Borg Quick Start to create a repository on a local or remote host. Note that if you plan to run borgmatic on a schedule with cron, and you encrypt your Borg repository with a passphrase instead of a key file, you’ll either need to set the borgmatic encryption_passphrase configuration variable or set the BORG_PASSPHRASE environment variable. See the repository encryption section of the Quick Start for more info. Alternatively, the passphrase can be specified programatically by setting either the borgmatic encryption_passcommand configuration variable or the BORG_PASSCOMMAND environment variable. See the Borg Security FAQ for more info. If the repository is on a remote host, make sure that your local root user has key-based ssh access to the desired user account on the remote host. Note that your pip binary may have a different name than “pip3”. Make sure you’re using Python 3, as borgmatic does not support Python 2. A borgmatic Docker image based on Alpine Linux. Another borgmatic Docker image based on Alpine Linux, updated automatically whenever the Alpine image updates. A borgmatic package for Fedora. A borgmatic package for Arch Linux. A borgmatic package for OpenBSD. If that command is not found, then it may be installed in a location that’s not in your system PATH. Try looking in /usr/local/bin/. This generates a sample configuration file at /etc/borgmatic/config.yaml (by default). You should edit the file to suit your needs, as the values are just representative. All fields are optional except where indicated, so feel free to remove anything you don’t need. You can also have a look at the full configuration schema for the authoritative set of all configuration options. This is handy if borgmatic has added new options since you originally created your configuration file. With this approach, you can have entirely different backup policies for different applications on your system. For instance, you may want one backup configuration for your database data directory, and a different configuration for your user home directories. When you set up multiple configuration files like this, borgmatic will run each one in turn from a single borgmatic invocation. This includes, by default, the traditional /etc/borgmatic/config.yaml as well. And if you need even more customizability, you can specify alternate configuration paths on the command-line with borgmatic’s --config option. See borgmatic --help for more information. However, see below about special cases. You can ignore this section if you’re not an atticmatic user (the former name of borgmatic). borgmatic only supports Borg now and no longer supports Attic. So if you’re an Attic user, consider switching to Borg. See the Borg upgrade command for more information. Then, follow the instructions above about setting up your borgmatic configuration files. That’s it! borgmatic will continue using your /etc/borgmatic configuration files. This will also prune any old backups as per the configured retention policy, and check backups for consistency problems due to things like file damage. Note that borgmatic prunes archives before creating an archive, so as to free up space for archiving. This means that when a borgmatic run finishes, there may still be prune-able archives. Not to worry, as they will get cleaned up at the start of the next run. You can run with only one of these flags provided, or you can mix and match any number of them. This supports use cases like running consistency checks from a different cron job with a different frequency, or running pruning with a different verbosity level. If you want to run borgmatic automatically, say once a day, the you can configure a job runner to invoke it periodically. You can modify the cron file if you’d like to run borgmatic more or less frequently. Feel free to modify the timer file based on how frequently you’d like borgmatic to run. You’ve got issues? Or an idea for a feature enhancement? We’ve got an issue tracker. In order to create a new issue or comment on an issue, you’ll need to login first. Note that you can login with an existing GitHub account if you prefer. Other questions or comments? Contact witten@torsion.org. If you’d like to contribute to borgmatic development, please feel free to submit a Pull Request or open an issue first to discuss your idea. We also accept Pull Requests on GitHub, if that’s more your thing. In general, contributions are very welcome. We don’t bite! For strings, prefer single quotes over double quotes. Limit all lines to a maximum of 100 characters. Use trailing commas within multiline values or argument lists. For multiline constructs, put opening and closing delimeters on lines separate from their contents. Within multiline constructs, use standard four-space indentation. Don’t align indentation with an opening delimeter. Then, install borgmatic “editable” so that you can easily run borgmatic commands while you’re hacking on them to make sure your changes work. pip3 install --editable --user . Note that this will typically install the borgmatic commands into ~/.local/bin, which may or may not be on your PATH. There are other ways to install borgmatic editable as well, for instance into the system Python install (so without --user, as root), or even into a virtualenv. How or where you install borgmatic is up to you, but generally an editable install makes development and testing easier. This should make the client keep the connection alive while validating backups. borgmatic depends on a Python YAML library (ruamel.yaml) that will optionally use a C YAML library (libyaml) if present. But if it’s not installed, then when installing or upgrading borgmatic, you may see errors about compiling the YAML library. If so, not to worry. borgmatic should install and function correctly even without the C YAML library. And borgmatic won’t be any faster with the C library present, so you don’t need to go out of your way to install it.